This sermon, “Easter to April Fool’s: A Confluence of Peoples, Ideas, and Cultures,” was originally delivered to the congregation of Harmony, a Unitarian Universalist Community, on April 1, 2018. It is published here with permission from the writer, with all rights reserved. Let’s talk about paganism and where Easter really came from. I’m fascinated by it. 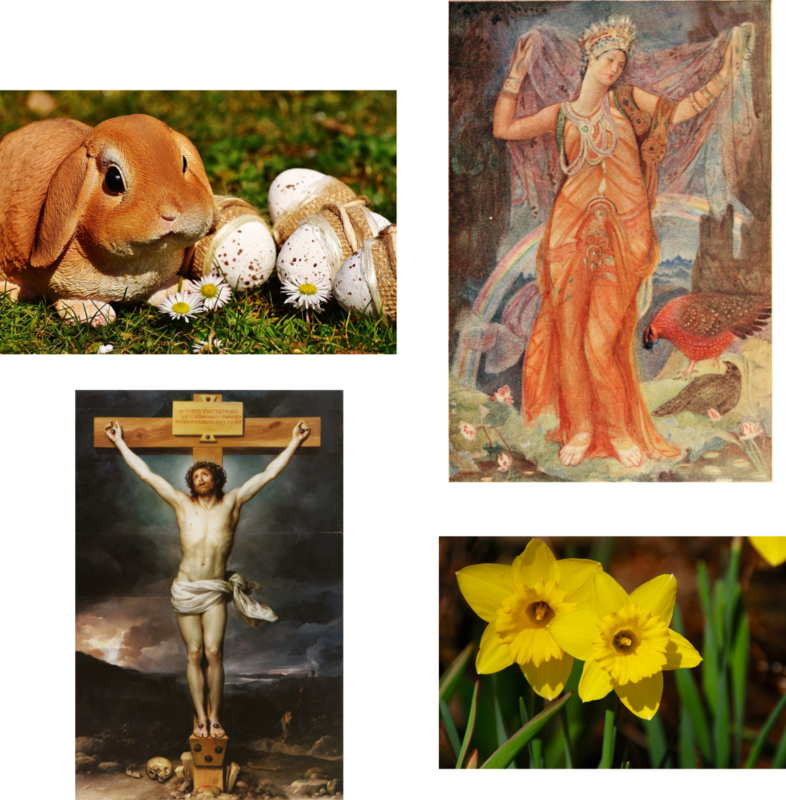 We have all kinds of things happening here on this day and we celebrate all of them: the Easter bunny, eggs, the goddess Ēostre, Jesus, daffodils. All of these things are confluent, not congruent. Confluence is when two rivers come together to make one river. Like the Allegheny and the Monongahela (I grew up on the Monongahela river and it goes into the Ohio). Confluence also means ideas and cultures that take traditions and create new meanings for them. Where does April Fool’s Day come from? There are some suppositions about this in research. One of the earliest ones is from 1562 in France. All Fools Day was celebrated because the Julian calendar changed over to the Gregorian calendar and it was around the vernal equinox in March. It’s the day where we have the half light, half darkness. Here’s the story of Ēostre. She is the goddess of fertility, new birth, multiple births even. Of course, she doesn’t spend the winters on the earth. She’s in Hades, like many of the goddesses who go on vacation where it’s warm. When she comes back one spring, she discovers a bird frozen in the snow. She apparently has a guilt complex about it, so she tries to bring the bird back to life. But the bird can’t fly. Instead, Ēostre simply takes the Bird and gives it hair, long ears, four legs, and makes it hop. It’s called the Easter hare, and became her pet. The Easter hare is very ancient and very pagan. Sometimes you see statues of Mary with a bunny. Everybody says, “oh, that’s so sweet, Mary and a bunny at her feet.” No, the Christians rejected all the fertility mythology around the Easter hare. They had to have a pure Mary figure. So what those statues really show, when you see the Easter Bunny at Mary’s feet, is not a pleasant companion. Mary is actually stepping on the hare, overcoming the evil of the rabbit. Here’s how the ancients celebrated Easter: They waited for sunrise, and they had a big bonfire. Then they purified water and the maidens were made to wear white. They think it’s because of the whole goddess symbol. When Catholics hold their Easter vigil today, the first thing that happens is a big bonfire outside the church. Why? Because you’re going to light the Paschal candle (Pascha is the Latin word for Easter). Second, you come in and there’s a baptismal font with brand new water in it—holy water. And guess what? All the people who are coming in the church wear white. Confluence, right? We’re still using those pagan things. Let’s talk about eggs for a minute. Eggs are very ancient symbols of fertility. 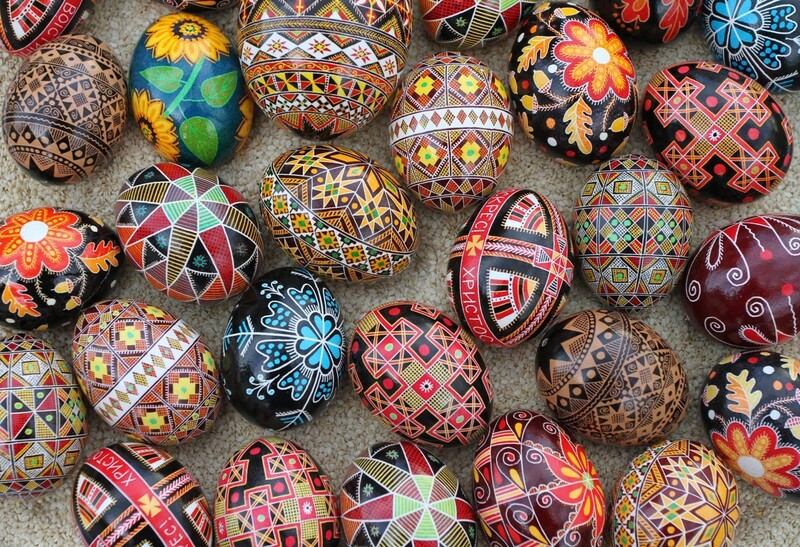 For example, in Iran they celebrate New Year’s on the vernal equinox and they paint eggs. And what happened to Zeus? Because gods don’t die, do they? They just kind of fade away. The pagans had such a hard time with visualizing God. 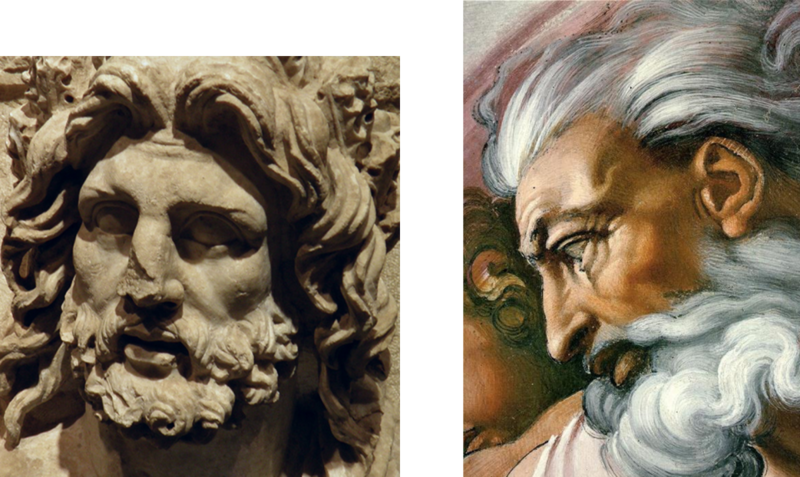 Compare the images above of a Zeus statue with the Sistine Chapel portrayal of God. Look at those noses—kind of alike there. The ancient Romans were really smart, because when they conquered a population, they just simply assimilated all the gods and goddesses of that culture and its religious traditions. They kind of amalgamated them. 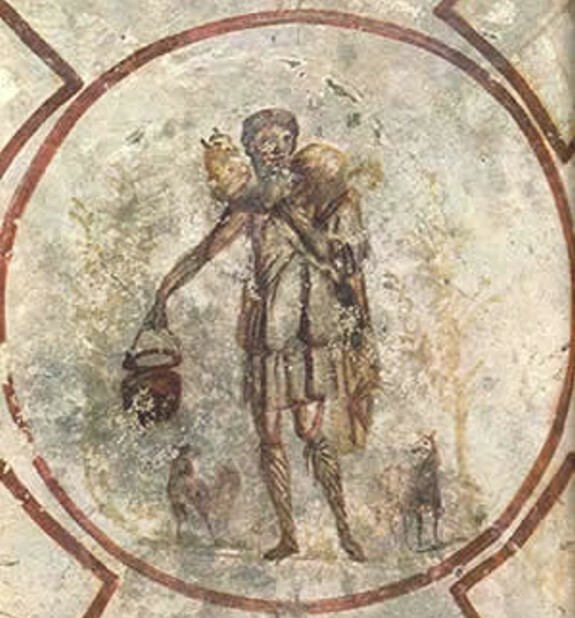 In the fourth century, Constantine decides that he’s going to change Easter to the celebration of Jesus. That’s when he declared Christianity to be the state religion. Let’s compare the image of pre-Easter Jesus with post-Easter resurrected Christ. The pre-Easter Jesus, the historical one, was a Jewish peasant who was trying to reform his Jewish church. Why? They were a lot like churches today. The synagogues were making lots of bucks. They were selling doves and all kinds of pigeons for sacrifice, and they were run by a group called the Sanhedrin. This powerful group set all the rules because religion and politics in Israel were so connected. They were getting pretty irritated with Jesus because he was creating some insurrection. 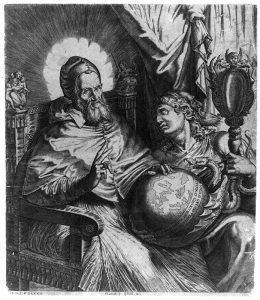 Then St. Paul came along, about 90 years after Jesus had died. Paul didn’t know Jesus, had no idea that Jesus worked miracles, but Paul was a great Roman citizen and a pretty good organizer. He had all these little house churches, and the stories they told there really amplified who Jesus was and what he did. Paul basically reinvented Jesus, or at least the identity of Jesus, as our savior God who came to save us from our sins. Jesus was crucified because he was an insurrectionist. He was really trying to reform a religion, not form a new one. But Paul had plans for a church. So he went around to Greece, Ephesus, Colossus, all of those places, and pulled together this system. He called it the Basilia of God. The basilia in Roman times was the town hall, and so the idea was, let’s get people out of their homes and put them in kind of a basilia, a town hall place where they can share food and stories of Jesus. Paul’s concept caught on quite a bit and it got so popular that by Constantine’s time he decided to make Christianity the state religion. Now the word is that Constantine kind of had this conversion, much like Paul had. There isn’t any documentation about Paul going blind or getting knocked off of his horse or any of that stuff, but we do know that he was a pretty good salesman and he connected and started this whole Christianity thing. He did reinvent the personhood of Jesus into the Divine Christ. The church got organized well enough out of Rome that a group of bishops called the Council of Nicaea gathered for this big discussion. They argued about whether Jesus was fully divine, or fully human, and they killed each other over it. 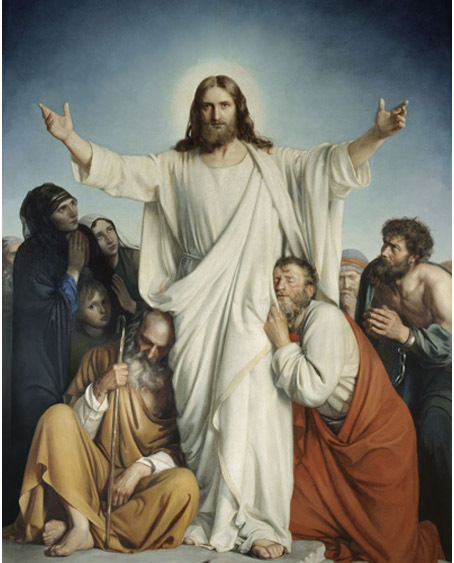 After about five years of fighting, they decided upon what’s known as the Nicene creed, which became a loyalty oath for Christians: “I believe in God, the Father Almighty, maker of Heaven and earth and all things that are visible and invisible…” Out of that also came the idea that there was only one true God and only one true son of God, Jesus. The two words that get us into trouble all the time, historically, are “only” and “true.” We have Mohammad as the only true son of Allah, and the only true holy family is Jesus’ family, based on immaculate conception. It’s ancient thinking, but it’s been reformed and given new meaning. 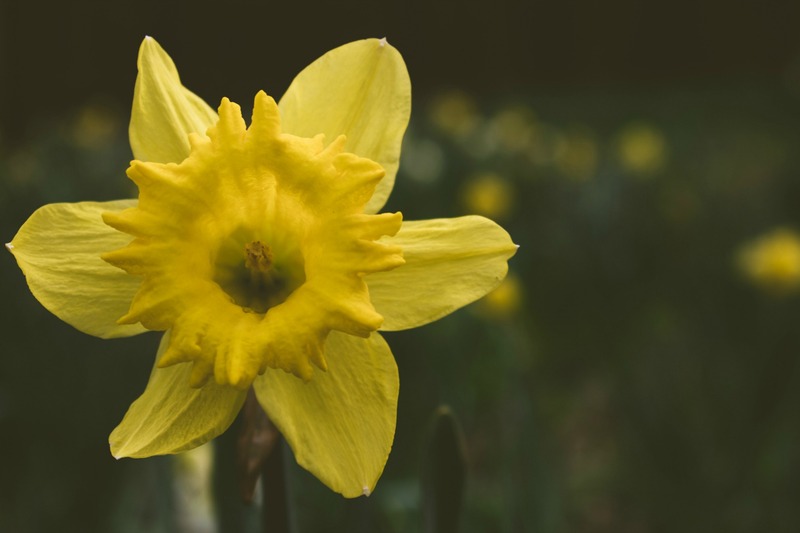 When I think about the tradition at its most ancient, I’m going to go with the daffodil. The celebration of the change of seasons has brought all of this meaning and this whole religious thing into context. When others might sing, “Jesus Christ is risen today, allelujah,” I’m singing, “Daffodil bulbs are here to stay.” Daffodils move all over. You can’t get rid of them without digging up the bulbs. For me, the true meaning of existence can be found in the daffodil, in nature. Karen Gottschall is a retired Catholic minister and member of Harmony UU.